Home > Magenta Wins Two Business Awards! Magenta Wins Two Business Awards! 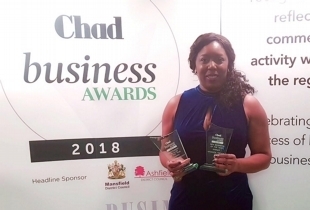 After being delighted to be listed as a finalist for the Chad Business Awards a couple of months ago, we were totally blown away last week to have won not only one, but both awards that we were nominated for! Being a finalist for these awards filled us with the greatest pride for what we have achieved with our business so far. It was a fabulous feeling to see that the business we have so much passion for had been identified by others as a great local business, with amazing promise for the future. Magenta Trends was entered into the Chad Business Awards 2018 awards amongst some incredible local businesses who we really admire, so to win within our categories was a huge honour. The Chad Business Awards 2018 award ceremony was held at Portland Training College, Mansfield on the 29th November. We loved the opportunity to get dressed up and join other great local businesses in our area. It was obvious that we all have an amazing passion for our businesses and we found it to be a very inspiring evening hearing lots of different business journeys. We won in both categories for New Business Of The Year 2018 and Independent Retailer of The Year 2018. The guest judge for the awards this year was Sean O’Connor from O’Connor Removals Limited. His comments on Magenta Trends were that our passion for Magenta just jumped off the application page and that our business showed forward thinking and fantastic future aspiration for such a young company. Hearing the wonderful comments about our business and winning these awards has given us a real boost of energy for taking our business forward in the new year. If you know us, you will know that we are full of enthusiasm for what we do, but seeing other peoples appreciation and understanding for our business really motivates us to keep pushing forward with all of our ideas in 2019. Watch this space! We have so many exciting things to come on this colourful Magenta journey of ours!